Carbonite is a cloud backup and storage company based in the United States. Their headquartered in Boston, and are a clear leader in the backup industry. But are they right for you? Today we’re going to pick apart this cloud backup provider piece by piece so you can make an informed decision before ever committing to a subscription. First off, note that they really focus on backups, which makes them an entirely different type of service than online storage providers like Dropbox or Google Drive. Keeping that in mind, let’s start analyzing this service by looking at their pricing model. Though their pricing is fair and reasonable, I don’t really like their subscription term lengths. I would have preferred that it was more granular, but they don’t offer monthly or bi-annual plans. Also, note that they don’t have a completely free version of their service. Some backup providers will let you use their software client free for as long as you wish, but restrict use to local backups only, which essentially cuts out all of the cloud storage features. 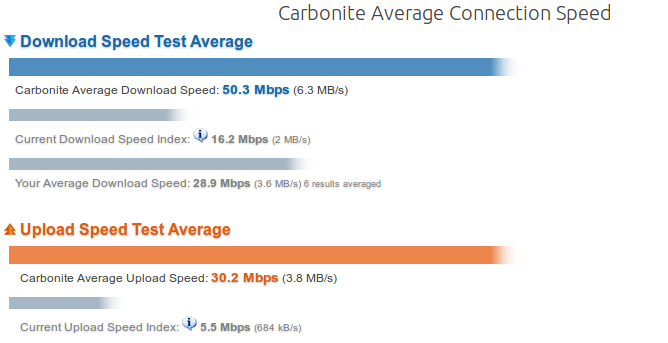 However, Carbonite only has a 15-day free trial. The first feature you should be aware of is that Carbonite doesn’t support very many operating systems. In fact, they only support Windows and Mac. So if you’re a Linux user, you’re out of luck. It only supports Windows 7, 8, 10, and OSX 10.6 and later versions. Furthermore, each subscription plan has different features, and each higher-level plan includes all of the lower plans’ features. The Basic version is pretty light, though it does have automatic and secure cloud backups and cloud storage. However, the cloud storage is restricted to one computer. But the Basic plan doesn’t permit local backups. And naturally, all the plans come with customer support. Next, the Plus plan improves upon the Basic plan with only two additional features. First, the Plus plan permits unlimited local backups. And secondly, it has a feature called “mirror image backups.” Basically, this is a drive imaging feature, that can clone your hard drive bit for bit, which is great for backing up your operating system in addition to your files. The third and last plan improves upon the Plus plan with two additional features as well. It adds an automatic video backup feature and a courier recovery service too. I like the idea of the courier service since it’s nice to have a hard copy of your data, especially if you experience hardware problems like a failed drive and need to completely rebuild a PC. Lastly, I wanted to point out a feature that I thought was a little odd. Though they do support Mac and Windows systems, Mac users are restricted to the Basic plan. The Plus and Prime plans aren’t available on Apple systems. I have to give Carbonite an A+ on their encryption methods. Users can opt for either automatic encryption using a 128-bit Blowfish key, or use stronger local encryption utilizing AES-256. Having the ability to choose encryption types can drastically speed up data transfers, too. For instance, consider that local encryption can significantly impact the time it takes to complete a file transfer. So, if the data you’re backing up isn’t sensitive (i.e. an inconsequential media file like a music library), you can use automatic encryption to cut down on transfer time. For all other files, however, I’d recommend sticking with local encryption. It’s a lot stronger, and employees, hackers, and other snoopers won’t be able to decrypt your data since you alone have access to the encryption key. Understand that the speed of your uploads and downloads is dependent on a myriad of factors, including whether or not you’re using a VPN tunnel, how fast your ISP connection is, whether you use automatic or local encryption, and so on. They claim that their users average as much as 50Mbps, but I didn’t see results anywhere near that fast (though your mileage may vary). My connection was about 29Mbps, which is still pretty darn fast by my standards. Also, I tested speeds when I had my VPN connected, and wasn’t disappointed with the results. VPNs are known to tack on overhead to any connection, and though it was significantly slower, the transfer speeds were still adequate. I was able to download at a rate of 4.7Mbps (581KB). However, I do want to caution you. One of the problems with any cloud backup provider is the time it takes to transfer massive files. If you wanted to backup your entire drive, I’d highly recommend just cloning it locally. Depending on the size of your drive and the speed of your Internet connection, the total time to complete the transfer could be more than 12 hours, and even days in some instances. The Basic plan will allow you to backup just about any user data that you wish, including documents, media, music, video, and so forth. You have the option to manually start a backup, backup continuously, or once per day. There is even a setting that will allow you to exclude certain periods of time from the backup scheduler. Unfortunately, if you want to backup files locally to an external HDD, you’re going to need to get at least the Plus plan. You can image your entire drive, but that feature isn’t included in the Basic plan either. The restoration features are as light as the backup features, but it will get the job done. It seems that they tried to make the process as simple as possible, and lets you restore previously backed up files with the click of a mouse. And that’s about all there is to say about it. There aren’t any bells, whistles, or restore features that made me say “wow!” Still, if you’re a non-technical user and like software that’s streamlined and simplified, then Carbonite’s restore features are for you. Carbonite does a good job of taking care of their customers with great online support. The knowledge-base is fleshed out, well-organized, and easily navigable. In addition to FAQs and setup guides, they also have a lot of how-to articles that show you step-by-step how to perform various tasks. One thing I didn’t like, however, was the absence of a live chat feature. If you want to open a ticket, you’ll have to do so via email. But in all honesty, the software is so simple that the vast majority of users aren’t going to need to use the guides or open a ticket for help backing up a file. The only use-cases I can think of that are common would be contacting support for installation problems. 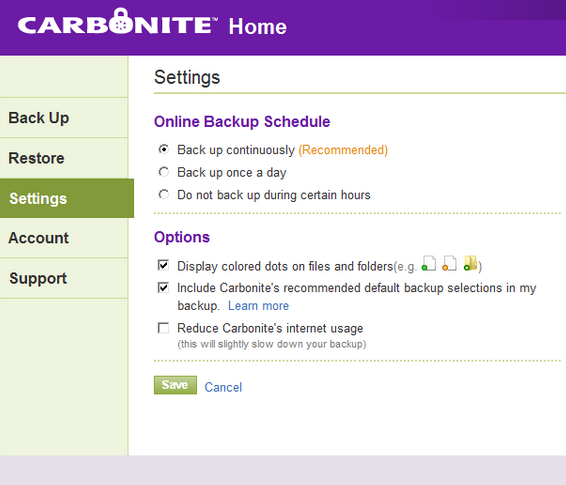 I was pleased with the Carbonite service, though I wish it had more configurable settings and a more granular manual backup and scheduled backup system. If you’re like me and want to fine tune your backups, you might be interested in SpiderOak One. One of the advantages to Carbonite is that they seem to focus on simplicity, which could be good or bad depending on your perspective. If you’re still not sure, I’d highly recommend taking advantage of their free trial. It will give you a chance to try out the interface and run a few test backups.